and it from first countries which export it. the plant famous is dates. we eat it with coffee but our coffee different from the black coffee it is include Cardamom. by the way, the women wear cover or veil we are called it (higaab) special by women. either education don't mix women with men in schools or universities we have more than 13 university ramify to several colleges from it . I studied and finished my university without I met any boys in seats of the studying. either the working there are committees , schools, associations, clubs and institutes ,special for women we have all freedom inside it but in hospitals the woman working beside men by all honoring and too by veil . maybe you are says in yourself what this complicating but believe me if you visit it will see a beautiful things and places . This grammar site is both entertaining and educational, which is not something we can say about all grammar web sites. Grammar Police is dedicated to saving the web and the world from bad grammar, poor diction, and the abuse of the English language in general. If you have a suggestion for an article, a pet peeve you want to get off your chest, or any other feedback, please contact the Grammar Police. As I mentioned earlier, I have been in Germany for three weeks. It was a business trip; by the way it was my first time in Germany. I'm working in Israel Post Company as technician and our company bought several new machines for sorting mail. The flight from Israel to Zurich was 3.5 hours. Now, I want to explain that the company which invited us for training course located in town Constance. The town is located near Switzerland border, because of it we have landed in Zurich. My arrival to Switzerland airport began with disappearance of my luggage. I went to agent of the flight company and a very pleasant agent explained me that soon my suitcase will be found. After filling out all necessary forms and documents I was depressed, but I hoped for best. So, we are going to Switzerland German border through Switzerland by a car which sent us by the company Siemens. I saw through a window of the car a beautiful autumn vistas .Our hotel was located near a lake of Constance. I've used the opportunity to walk around the lake when I had free evenings. It was quite cold for us, about 3-4 degrees of Celsius, and we used to higher temperature. 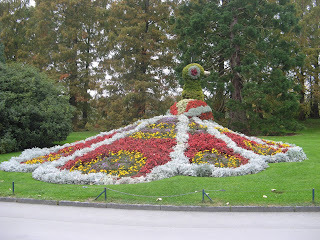 I've visited the island Mainau which was very known for people who love flowers and plants. It was huge botanical garden. 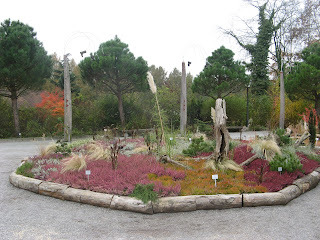 There were large squares for different plants and flowers. It w as very beautiful. 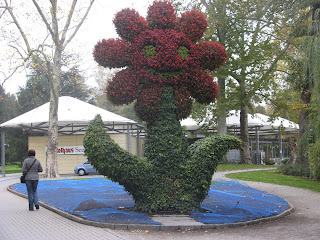 The huge figures of flow ers are interchanged with mini gardens. I've walked there for about 3 hours and didn't finish to look over everything. I snapped many images by my camera, and after my business trip I want to make slideshow on CD. In general, there were a lot interest sites but sadly I didn't have time for this. I've liked a transportation in German, if on the time table was written for example 16 o'clock, it meant that a bus or train shall arrive exactly at 16 o'clock without to be late - It's very difficult to imagine it in Israel. I was talking with Germans on the streets many times and I've got an impression that the English is well known only to young people. So, I want to say that it was a different culture of behavior than we have in our country. You can't see any noisy people who talk loud the street. The drivers of the cars are strictly observe the rules of traffic and not beeping without reason. One day, I’ve walked near by our hotel and into my pocket I found piece of paper which was not usable for me. You don’t believe me, but I was traveled something about 2 kilometers to throw it. It is a shame to throw out something outside trash urn. Everywhere I was feeling discipline and order. Our training course is continuing and we are day by day discovered something new about our equipment. In general, I want to say that 25-30 years ago such equipment with suchlike possibilities would no be is possible. Those machines allows to sort mail without a human participation. The company Siemens is very big company that produces many tipes of equipment and electronic components. We were studied on a little part of this company which practiced us for mail machines production. By the way, I used opportunity and was writing only English. The all technical documentation was in English language. Our course is passed normally, a lot of studying subjects we knew. Exception of it was new technology recognize an image of letter and network between computers. In other words, we didn't begin from "scratch" level, because we had big experience of work with similar machines. Three weeks were passed quickly and we have come back at home. In the end of our training course, our German friends gifted for each one of us a book about Germany. The book was contained with lot views about Germany. After our return, we have to teach and prepare other technicians for new equipment. It was an interest trip and I think that will do whereof to remember. What kind of writing do you do in English? Of course, basics are important in all writing and grammar is still grammar. But purpose, audience, special forms or genres and specialized vocabulary make a big difference in how you write. What is fine in a personal letter may not be at all suitable for a business letter. Engineers' reports follow different form and style than lawyers briefs. Chatroom and IM slang is never suitable in business, technical or legal writing. That's confusing. I know. It must seem like having to learn many languages or at least dialects just to be able to use one. Learning the most used formulas - rules or guidelines - for different genres will make the task less confusing. That is also why it is important to know what kind of writing you need most. So think about your 'writing needs' and tell us about them. You probably even use more than one kind depending on why and to or for whom you are writing. I have some question ...??? I just found some of my mystake in my writing. I don't know what kind of part of speech is this but I will give you an example.. I can use "very big" but I can't use "very huge" because it's already mean "very big" . I'd like to know what is the key word to google or where can I learn this kind of part of speech. Anyone here working in engineering or technical field? Hello Vanessa and all classmates.I am sorry for I have joined the class so long time but I have not introduce myself to everyone. I am Sundexin.I am 22 years old.I am single. I live in BeiJing of China.My father and mother live in HeiLongJing province of China.I have a sister who live in HaErBin city of HeiLongJiang.She is doctor.I am programmer in China National petrolum corporation.I like studing English very much.I read English news everyday.It is also one of my hobby. Though I began to study English for years,some basic knowledge is not firmly.For example,my spoken English and grammer are very poor.I am fortunate to know the website.I hope make friends with everyone. Hello Vanessa and all classmates. I haven't posted to this blog for long time, so I'd like to introduce myself to new members. My name is Sadamu. I'm 68 years old. I have a wife and two children. My daughter has married and she has a three years old girl. I now live in Saitama prefecture, Japan. I began to learn English in Vanessa's class in February, 2004. I wanted to be able to read an article on newspaper in English, to understand radio in English, and to write letters in English. Vanessa advised me to write my journal in English everyday, to check 5 words which I don't know in a day and to study English 15 minutes everyday. I couldn't keep all of them. But I have been keeping writing my journal in English. It becomes my hobby now. I can't go to bed without writing it. I now read an article of New York Times front page but I still feel difficulties to understand them without dictionary. I use English-English dictionary often. But my dictionary, American Heritage is a little hard for me now. Hearing in English is still difficult for me. I guess it is because of my poor vocabulary. Now I'm interested in speaking English additionally. I'm taking conversation class every month. I think I made big progresses in writing English. I have three pen-friends who exchange e-mail in English. Two of them live in USA. Now I have three hobbies. I practice to play ocarina for ten to fifteen minutes everyday. I have played for two and half year but I'm still in beginner level. I'm now crazy about playing contact bridge. I spent nine days for it last October. I'm still working at hotel for 5 hours a day, half of a month. So I am now busier than when I was in my active service. By the way, Halloween is not popular here in Japan. I do nothing about it. Hello Ms Vanessa and all old and new members. My name is mata and I’m Ms Vanessa’s class since 2005. I like English language and want some day talk English rightly. I’m from Greece. I’m 37 years old. I have a family. I have been wedded by young age and now have three big children if comparative them with me. I should to attend my family and thus I could not finish my study. I hope this September to begin the school’s lessons for two years. All these years where I attended to my family I made a lot of jobs. It was very tedious for me because I was a child. But now I’m very happy for all these difficult years, because I have three daughters who love me and some times take care of me. I work in a laundry three days a week for this time and from May since September I work six or seven days to week. It is hard work, but I have no opportunity for another better one for now. I have a lot of hobbies but unfortunately some of them I can’t do. I like very much to exercise my body. At the past I played tennis, after that I entered in a volley team .It was fantastic experience. Now I go to a gym. Except athletic activities I like to read, to listening music, and to work with photographs and treatment video in the computer’s programme. These are some things about me. I’d like to hear some news from you too. Multiple Intelligence theory suggests that no one set of teaching strategies will work best for all students at all times. We each have different strengths in the seven intelligences, so any particular study or learning strategy is likely to be effective for some, and yet, not for others. Because of these individual differences, learners should try out different study and learning strategies to see what works best for them. Learners with strong or well-developed Intrapersonal Intelligence think deeply inside themselves, love setting goals, meditating, dreaming, being quiet and learn best with private study places, time alone, self-paced projects or study, making their own choices. Each person possesses all seven intelligences - MI theory is not a "type theory" for determining the one intelligence that fits. It is a theory of cognitive functioning, and it proposed that each person has capacities in all seven intelligences. Most people can develop each intelligence to an adequate level of competency - although an individual may bewail his deficiencies in a given area and consider his problems innate and intractable, Gardner suggests that virtually everyone has the capacity to develop all seven intelligences to a reasonably high level of performance if given the appropriate encouragement, enrichment, and instruction. Intelligences usually work together in complex ways - Gardner points out that each intelligence as described above is actually a "fiction"; that is no intelligence exists by itself in life (except perhaps in very rare instances in savants and brain-injured individuals.) Intelligences are always interacting with each other. There are many ways to be intelligent within each category - there is no standard set of attributes that one must have to be considered intelligent in a specific area. 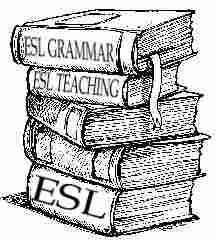 Consequently, a person may not be able to read, yet be highly linguistic because he can tell a terrific story or has a large, oral vocabulary. Similarly, a person may be quite awkward on the playing field, yet possess superior bodily-kinesthetic intelligence when she weaves a carpet or creates an inlaid chess table. MI theory emphasizes the rich diversity of ways in which people show their gifts within intelligences as well as between intelligences. Which are YOUR strongest and best developed intelligences?